Although called monument it is not a single monument but a region of approximately twelve thousand acres of wild, rugged terrain which has been declared a reserved protected area. Within this area lies the "Heart of Rocks" containing the world largest collection of balanced rocks and awesome pinnacles. Some of the rocks have been given a name by the Civilian Conservation Corps, during their stay here in the 1930s. 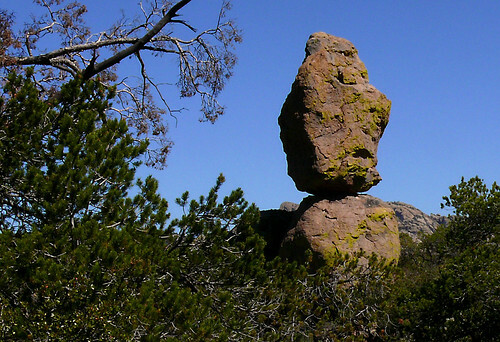 Big Balanced Rock - is one of the most photographed features of Chiricahua National Monument. It is 24.8 feet wide but sits on a base only 4.3 feet across. It weighs 652 tons and is located at an elevation of 6865 feet. Quite an interesting array of photos. I'm honored that one of mine is featured here. Very Nice! glad to be a part of your collection. I lived in the Chiricahua Mountains for awhile, very beautiful area and not very well known. There's a balancing rock in Mahabhalipuram near chennai in India !!! Is these are the only locations where we can find balancing rocks? Thank you Soulituder for info regarding the balancing rock in Mahabhalipuram near Chennai. I will have a look at it and make a post about it in due course. There are many precariously balanced rocks in the World. Do a web search and you will get many more.